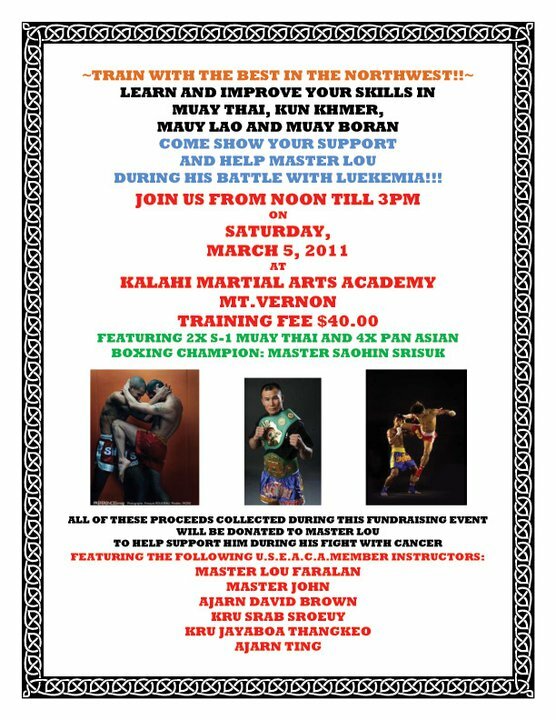 This Saturday March 5th, 2011 United South East Asia Cultural Association (USEACA) will be holding a 3 hour fundraising Martial Arts Seminar at Kalahi Martial Arts Academy in Mount Vernon, Washington. This seminar will consist of techniques from Muay Thai, Muay Boran, Muay Lao, and Kun Khmer. The seminar fee is $40. Proceeds of this seminar will be contributed to help Lou Faralan during his fight with Leukemia. USEACA beyond being a cultural and Muay Thai sanction regularly give back to the Southern Washington community and this is a sign that their spirit of giving of to the community isn’t lost with their growing profile and influence. Lou Faralan runs the Kalahi Martial Arts Academy and offers Muay Thai and submission wrestling among many other martial art disciplines. Lou has been a long time fixture of the Washington and Northwest Muay Thai scene for quite some time. In attendance will be Saohin Srisuk, Lou Faralan, John Chamkunthod, Ajarn Ting, Boa Thangkeo, and Srab Sroeuy will be on hand to give instruction. I can personally say that this is about as complete of a seminar as one could hope for and it will be an especially rare opportunity to get personalized instruction from John Chamkunthod who has in the past worked with K-1 fighters and many top level United States and Canadian Thaiboxers. ~ by fatsoking on March 1, 2011.